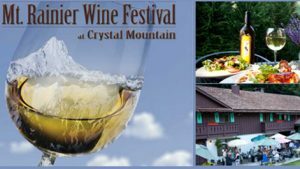 Experience an alpine summer at Crystal mountain with some of Washington’s best wineries, live music, great food and other fun festivities. The 8th Annual Mt. Rainier Wine Festival is happening Saturday, July 8 from 2-7 p.m. on the Alpine Inn Lawn. Hook Me Up will be playing great jazz music. Many of Washington’s best wineries are participating, and you can even enjoy some delicious light appetizers. Entry Fee $45 — includes 8 tasting tickets, souvenir wine glass, raffle ticket and light appetizers. Purchase tickets today on Eventbrite. Even better, make it a weekend! Take a scenic trip on the Mt. Rainier Gondola to 6872′ for panoramic views. Explore Mt. Rainier National Park. Hike, go on a horseback ride, relax. There are great Mt. Rainier lodging options at Crystal Mountain. Click here.